A young man who was up early to hustle with his motorcycle was reportedly killed by officers of the Nigerian police force whose primary duty is to protect lives and properties. 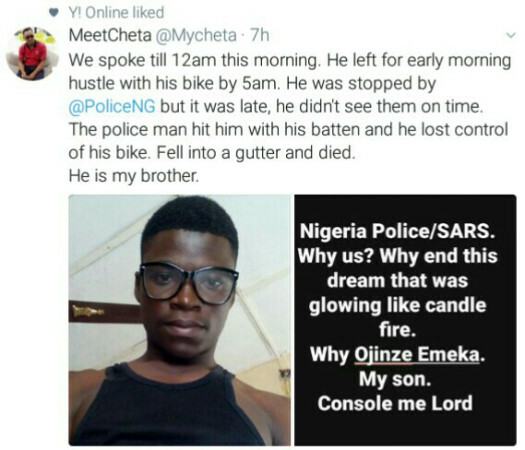 The deaseased whose name was given as Ojinze Emeka was said to have left the house in the early hours of this morning in search of his daily bread. On getting to a checkpoint, he was flagged down but he didn’t see the police officers on time so he drove pass them. An angry officer, reportedly hit him with a Barton and he lost control of the motor bike and fell into a gutter and eventually died. The death of this young man has left the whole family devastated. "We spoke till 12am this morning. He left for early morning hustle with his bike by 5am. He was stopped by @PoliceNG but it was late, he didn't see them on time. The Police man hit him with his batten (baton) and he lost control of his bike. Fell into a gutter and died. He is my brother" Mr. Cheta lamented on social media. The police is yet to respond to the notification on its Twitter post about the incident. It would be recalled that Nigerians have in recent times championed a course against police brutality with the hashtag, 'EndSARS' targeted specifically at the Special Anti-Robbery Squad accused with all manners of atrocities.